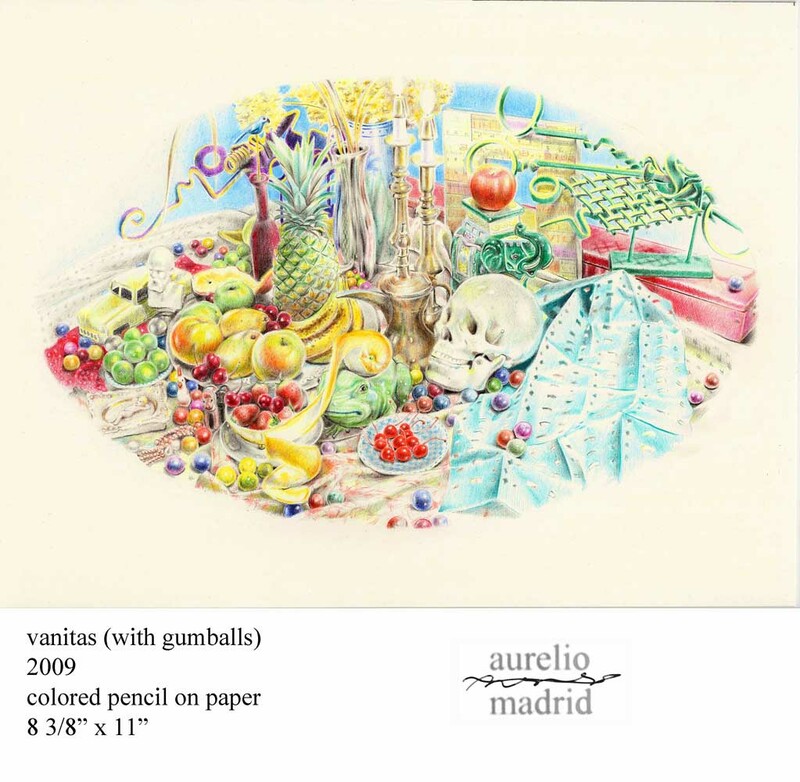 This drawing is based on a vanitas theme, intended to emphasize the transience of life. It is a somber message, so I chose a little frivolity, by adding the gumballs. 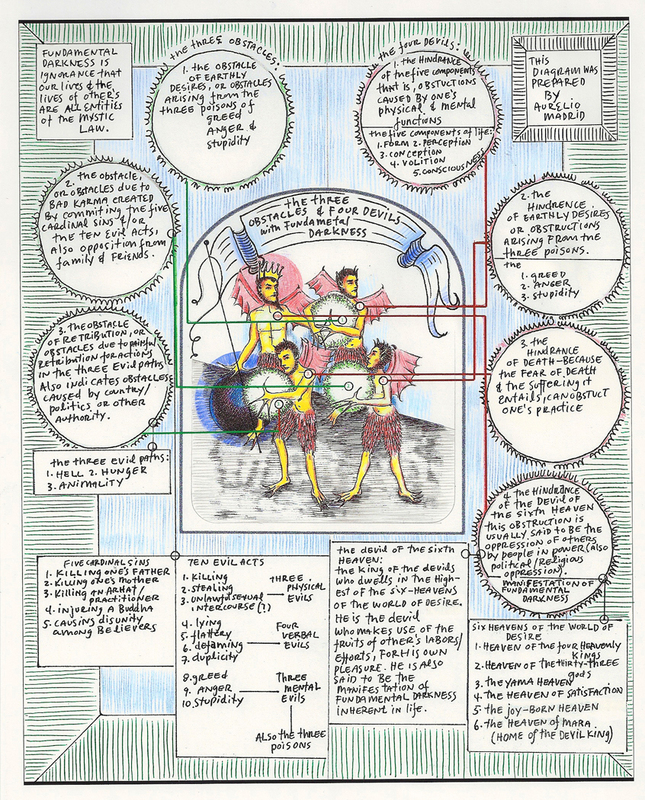 Each item was selected for its color and symbolic value. My light pencil-work is also meant to be uplifting and ethereal. A carefully staged photograph of mine was the starting point. I followed the photo closely, but tried to move away from a strict photographic look. The drawing is a reminder that life is fleeting, but that it should be enjoyed in detail, at every moment. Fundamental Darkness is many things, including not recognizing our own Buddha nature & not recognizing the Buddha nature in others. A key difference from a traditional/western notion of evil, is that we Buddhists acknowledge that fundamental darkness is latent in all of life (including our own), rather than occurring only in specific individuals/groups exclusively. The theory is that we can use it as a motivation, a catalyst to improve, & as an impetus to strive for enlightenment. “Earthly desires are enlightenment.” Once we can identify when, where & how fundamental darkness invades our daily lives (by chanting Nam-myho-renge-kyo to the Gohonzon) then we can strive to pursue our own Buddha-nature with greater force & conviction, since we have taken the vow to improve by practicing Nichiren’s Buddhism. As I’ve repeated, Fundamental Darkness lies (dormant or active) within ourselves, just as our own enlightenment does, this realization can help to better understand others, since they too are going through their own great struggles with the Devil of the Sixth Heaven. Fundamental Darkness is the ignorance to the truth of one’s life, and ignorance to the Mystic Law, indeed ignorance (not to be mistaken for innocence) of the law of Nam-myho-renge-kyo. The recognition that Fundamental Darkness is a fact of life might be a tool that helps us see our similarities, rather than our differences. You fight Fundamental Darkness & so do I. When we see that each person contains (more-or-less) the best & the worst of our own-selves (in a variety of degrees exaggerated, enhanced, suppressed, repressed, unseen, magnified &c.), then we can stop seeing others as “the other,” & simply more like ourselves. Saying: “she is like me,” is more difficult than, “she is bad, or she is evil.” “All men are created equal,” includes women, minorities, the oppressed, the poor, the voiceless, your enemy, & yourself. This is the wisdom of y/our enlightenment. Aurelio: …just looked at your coin collection on flickr again (out of 7 or 8 times & counting), before I writing back to you & noticed some more coins I hadn’t looked at before. Wow, this collection must be something to see in person, but the flickr way is great too, and perhaps not as much work to sort through manually. Your collection is very impressive & also the archiving of the coins is not to be overlooked, as I said before, great work! How did you get involved with numismatics? Are there certain coins that started your fascination?–or was it something else that got you going? I had been scanning my little collection, rather than photographing them. 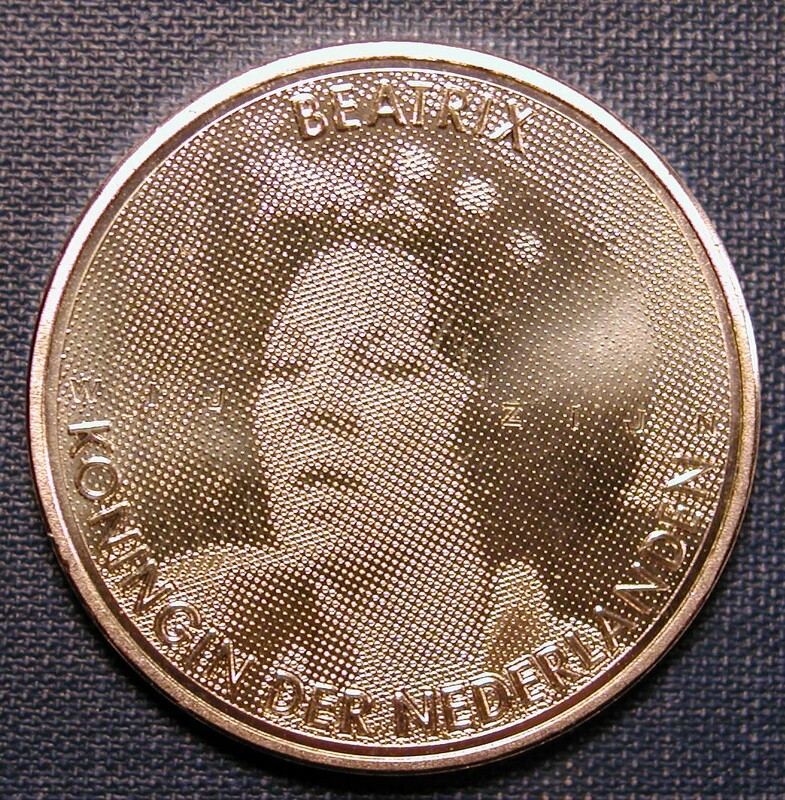 It seems the detail is softer when the coins are photographed. Do you have a special set-up for the coins? Or do you just point-n-shoot? Tiffany: My involvement started when I was a kid. My father loved coins and gave me my own penny folder for a collection. He didn’t have any vast great collection, but he liked to collect unusual circulating change. I have sort of gone in cycles of collecting for 15 years. I’m only marginally active at this time only getting my yearly US coinage. I do not have any theme whatsoever. I collect coins that I just basically like the design of mostly, but that’s not always the case. I do have to say that my favorite area of collecting is commemoratives. I have many different sources for purchasing, eBay is one of them, but I am a member of the coinpeople forum and purchased vast amounts from its members, also certain websites such as chervonets.com. I had not heard of V-coins before, but as I said I am not in an extremely active cycle right now. Scanning is good, it’s hard to get the coloring right, such is the case with photographing as well. I have yet to find the perfect setup to capture the coins perfectly, but it gives me something to strive for. I never had a real setup per se, but I had a book and a gooseneck lamp with a compact fluorescent bulb I use as well as a macro lens. I just recently purchased a light box but have yet to set it up and try it out. That’s my next stage. Where are you from? Tell me about your collection. Aurelio: …so your dad started you off with your 1st penny folder [these folders are used to organize & categorize coins, usually within a period of time &/or theme]. I wonder if you still have those pennies, or any part of your dad’s collection. It sounds like you have been involved with numismatics for sometime & your theme for collecting coins is basically numismatics itself, you just love coins, you love collecting & that’s great. I have not yet looked at your commemoratives yet. I’ll have to do that soon. I think my 1st fascination with coins started when was a kid too. It has become more pronounced now that the internet makes it so easy to buy them (sometimes). My grand-parents had a small general store in Southern Colorado & I’d have to help count change, from time to time. Grandma would have these little brown bags packed with change (along with a coffee can or two…don’t ask me why she kept change in paper bags) & I would sort it count it out & put the coins into their rollers. Then we could go to the bank to make a deposit or whatever. Once she pulled out a few bags that apparently had been in a storeroom for sometime & while sorting through it I found a couple of Indian head pennies, a buffalo nickel & a mercury dime. I was so intrigued by these little finds. I’d stare at them for hours, imagining the stories they could tell. I wish I still had those coins, they probably wouldn’t be worth much, but their personal value would be huge. Now that I think about it, the sense of intrigue has not diminished. I still stare at coins a lot, whether they are mine, yours, or someone else’s. Unlike you, I have not archived my whole collection & if I did it still wouldn’t match the size & depth of yours. The bulk of it consists of circulating world coins, from all corners of the world, a lot of notgeld from Germany & Austria (some of these notes can be really fun to look at) & growing collection of European coins from the 16, 17 & 18th centuries. I love handling these old coins. I know this might be a no-no for the purist, but I can’t resist touching them & imagining the hands that have touched them. I will sometimes carry the coin in my pocket for a day, just to get to “know” the coin better. Of course it should go without saying that the nicer the coin, the less it’s been handled, therefore most of the good-looking coins haven’t been handled too much & probably have spent most of their “lives” in drawers, boxes, &c. Do you handle your coins; touch them to feel the texture & that sort of thing? Do you have any coins that you linger over? Another of the aspect of the coins I love is that they are miniature artworks. With the bas-relief format it is amazing how much can be depicted, kings, queens, presidents, animals, monuments, buildings, battles, births, &c., &c.
I live in Denver what about you? I have the Denver Mint here that I have not been to for a long time I need to go soon. Tiffany: I do still have that penny folder. A few years ago my mother took me to her safety deposit box and gave me my father’s collection. That was actually what got me started collecting foreign coinage. He had coins from all over the place and I was captivated by the designs. This is why I like commemoratives so much because of the different designs. I don’t handle my coins extensively I generally only handle by edges only. I too, though, like to imagine who’s hands the coins have passed through, especially ones that date back to the earlier centuries. Aurelio: I’ve realized that it’ll be fun to list my top 11 picks from your collection & hyperlink ‘em too. (If you have any thing to say about these feel free). Tiffany: You picked some of my favorites. German States are probably my favorite, probably because I’m from a mostly German heritage. And yes I am in St. Paul. Sorry, I thought I mentioned that before…. Although David Hume said that causation is the “cement of the universe,” I couldn’t use any of what he said on causality for this discussion (other than this little quote). I also couldn’t talk about Aristotle’s views on causation, his four causes &c., although he did say that “all causes are beginnings…” (Aristotle, Metaphysics, Book V, Part 1). Both thinkers are not silent on the subject, & I am not suggesting that what they had to say on causality is valueless, but I did have to put them aside, since their brilliant theories (on causation) are ancillary to this month’s gosho: “Lessening One’s Karmic Retribution.” The Buddhist philosophers Daisaku Ikeda & Nichiren Daishonin are of complete relevance here & it is their thoughts I will focus on. The word Renge in Nam Myoho Renge Kyo means lotus flower (in Sanskrit), it also signifies the concept of the simultaneity of cause & effect. Simultaneity here suggests that by chanting Nam Myho Renge Kyo one can (with faith) access/cause one’s Buddha nature to be effected immediately. We believe that we all contain (and can access) our own individual Buddha nature (enlightenment) & that by chanting Nam Myho Renge Kyo we will manifest it in our lives immediately. The lotus seeds & blooms simultaneously, which is why it’s used as a metaphor for this concept. 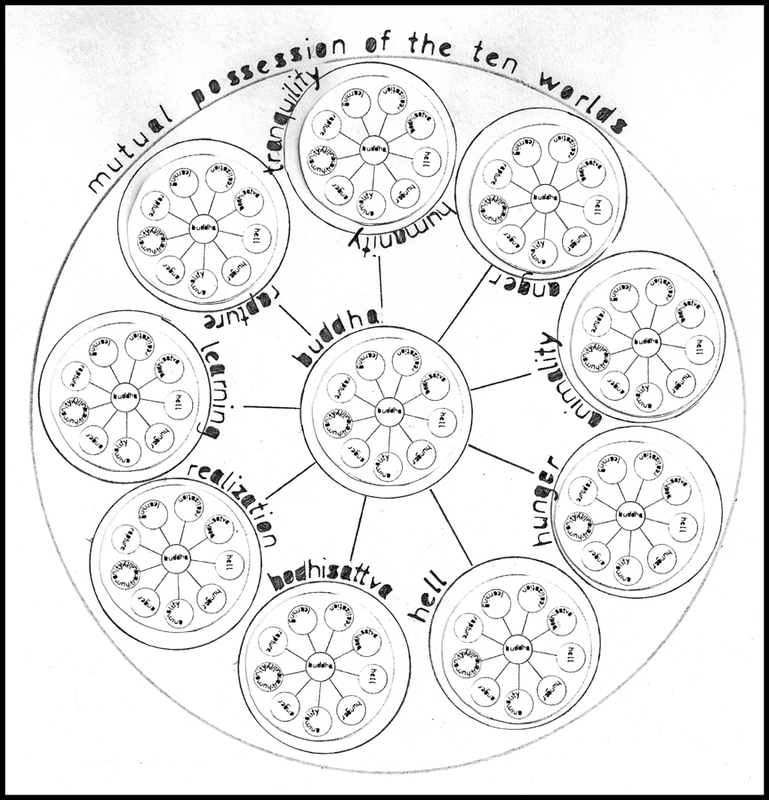 The form of causality that is simultaneous is as I just described & it is also related to the concept of the 10 worlds, since (the theory is that) we inhabit all the 10 worlds at once (& we have mutual possession of the ten worlds) & are able to use the nine worlds to propel us to the tenth world of Buddhahood &/or enlightenment (by chanting Nam Myho Renge Kyo). Non-simultaneous causality is also important here, because all the past actions we’ve taken (in life), (good or bad), are also inevitably contained & manifested in our present lives (karma) & on into our future lives. 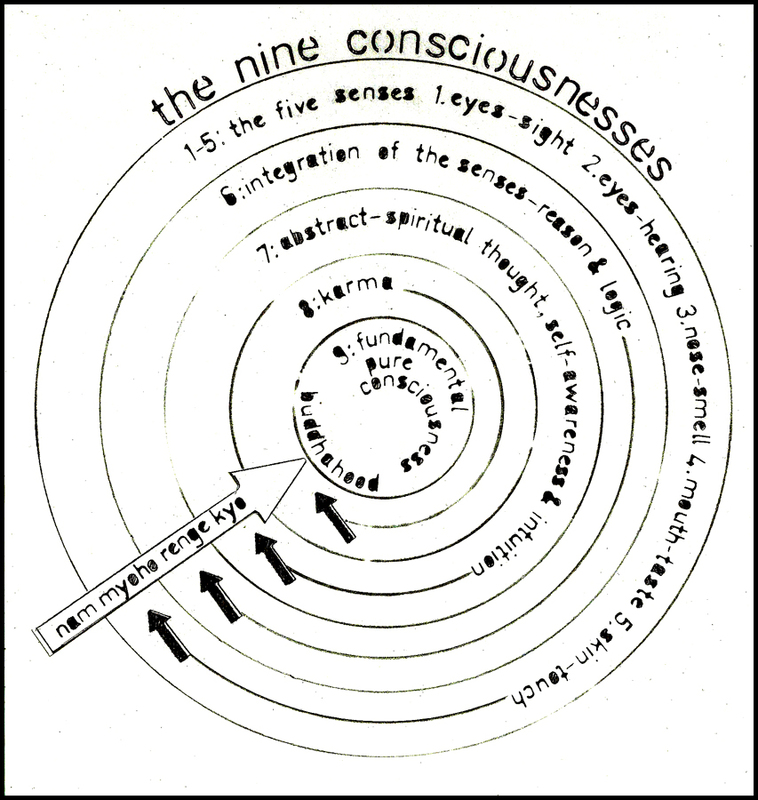 The nine consciousnesses concept describes the Alaya (8th) consciousness as the karmic store-house: where all our past actions, thoughts, words (&c.) are stored as latent potential. Karma might also be seen as an intermediary between cause & effect (in non-simultaneous cause & effect). Karma is where all our latent causes are waiting to be “effected” by some external stimuli in one’s life. When we look into (note that it is said that karma is unconscious, but let’s say that we can look into) this store-house & rummage through our past causes, we are able to understand our present lives better, we are on the road to enlightenment, & we are enlightening our own lives, by doing so. “If you want to understand the causes that existed in the past, look at the results as they are manifested in the present. And if you want to understand what results will be manifested in the future, look at the causes that exist in the present” (WND-1, 279). To face the problems of life with courage & faith is the goal of Buddhist practice, along with doing (& helping) others to do the same (in their lives). We must see that as Nichiren says: “difficulties will arise, & these are to be looked at as ‘peaceful’ practices” (Nichiren Daishonin, The Record of Orally Transmitted Teachings p. 115). When one decides to practice Nichiren Daishonin’s Buddhism, one essentially commits to transforming one’s life, instead of accepting our “destiny,” then we can transform our karma with the Buddhahood that resides within us all. Ikeda goes on to point out that this act of lessening one’s karmic retribution is at the heart of our practice. Let us effect the cause of Buddhism in our daily lives as imperfect as we are, as we suffer through our hardships, as we rise to challenge our past mistakes, as we join together to celebrate our victories & as we chant Nam Myho Renge Kyo.